Don Geiss is CEO of General Electric within the show's universe and Jack's immediate boss. Jack considers Geiss to be his mentor and idol. Geiss has a mentally challenged daughter, Kathy Geiss, a secret second family in Canada (a reference to Torn's co-starring role in Eulogy), and a third secret attic family. He is a fan of Tracy Jordan's work. Geiss is characterized as having racist and sexist tendencies. Geiss is first introduced during his own diabetes research golf tournament. After Jack's fireworks disaster in "Fireworks", Geiss demotes Jack to Vice President of East Coast Programming and takes away his Microwave Oven Programming duties. Geiss eventually decides to retire, and chooses Jack as his successor. The CEO slips into a diabetic coma, however, before the appointment can be announced, and the board places Geiss' grossly inept daughter Kathy in charge of GE. When Geiss comes out of his coma, he decides to remain CEO. In the episode "Future Husband", Geiss dies, but former GE chairman Jack Welch keeps his death a secret while GE negotiates a takeover with the Philadelphia-based cable company Kabletown (which is fairly transparently based on Comcast). Geiss is cryogenically frozen in carbonite at an Episcopal service. In his eulogy, Jack says that Geiss invented the nightlight and the fear of monsters under the bed (to sell more nightlights). Previously, Jack had also credited to Don Geiss raising one finger to stop someone talking, the abrupt conversational segue, and the phrase "Make him/her an offer he/she can't refuse." 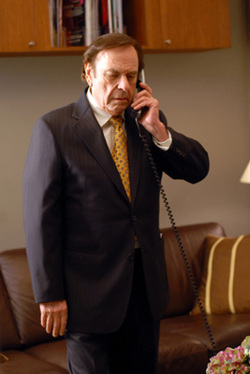 Don Geiss is portrayed by Rip Torn.